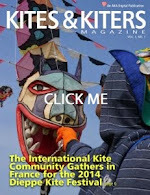 Tako Kichi (Kite Crazy): A New Way to Use a Power Kite on the Water! A New Way to Use a Power Kite on the Water! I'd like to try this one even though it's still in prototype. This guy caught an updraft for 22 seconds of hang-time.